At the end of last week, I made a few exciting purchases on eBay. 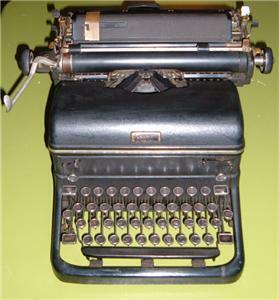 First, I bought an antique typewriter which is identical to the one my grandma use to own. It’s a ginormous black Royal typewriter. This is one of the extra-tall beastly machines. As it turned out the seller also lives in Portland. I was prepared to wait a couple weeks for my new typewriter to be delivers but on Sunday afternoon I returned home from running errands to discover that my purchase had been hand delivered to my doorstep! There really are nice people out there! I also bought a screen printing set. I haven’t done any screen printing since I was in college fabric design classes and really enjoyed it then. Someday maybe I’ll have time to experiment with this. Finally, the item that is most anticipated: I was the winning bidder on an antique flatbed letterpress!!! This is the same type as one of the presses I used back in college and I was so excited to find it just 18mins before the bidding had ended. The only bad news: I have requested a final invoice from the seller and this morning sent them another email asking for the full amount to pay and they have not yet responded! I’m getting worried that they found someone locally and sold it to them instead. I’ll give them the benefit of the doubt that they went away for a 3-day weekend and that’s why I haven’t heard anything from them yet. Most people are pretty eager to get payment. So if this deal fall through, I’ll have to start looking again for a letterpress. I’m still on the hunt for a new car. On Saturday, I went to the VW dealership and test drove the Beetle. Such a cute car. Reminded me of my first car…except this bug didn’t stall in the middle a major intersection, I didn’t even once have to push it, and I didn’t end up walking back to the dealership. So basically, nothing like my first car. I didn’t really like the salesman I dealt with though. He thought he could convince me that the sticker price was as low as they could sell it for. Then after my boyfriend arrived, the salesman only talked to him. Kind of disappointing. In other news–I’m back to a super-busy work schedule! I’ve been at the office every day for the past 16 days and I could really use a nap. This entry was posted on April 3, 2007 at 10:04 am	and is filed under Uncategorized. You can follow any responses to this entry through the RSS 2.0 feed. You can leave a response, or trackback from your own site.